Potty training (or potty learning, depending on who you ask) is an exciting and messy adventure. It is a huge milestone for any child, and a relief for many parents. 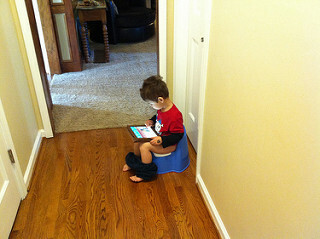 Mind you, while your child is learning to use the potty, there can be a lot of frustration. Potty training is actually something a child has to learn by himself, and he has to be ready. Here are some tips for you. Punishment is not an effective way to get your child to pee and poo in the potty. In fact, it is extremely likely to decrease the chances of potty training success. Using cloth diapers may help your child to learn to use the potty earlier on in life. Sometimes, simply removing diapers and putting on underwear will be the most important step in the potty training process. You can take your kid to buy nice new underwear that he or she chooses as a motivator. Allow your child to play with the potty and sit on it whenever she wants. Let her come into the bathroom when you use it too. Children learn by imitating, and potty training is not an exception. Make sure you always have a change of clothes with you when you go out. Toddlers do pee their clothes outside the house, where they do not have easy access to a toilet or potty, more often than inside. Consider starting the potty training process during the summer, when wet pants don't cause so much trouble. How Long Before One Sees The Results Of Accutane? Potty train at what age?